"Jewish groups call on Trump to fire senior advisor Stephen Miller," APN among Jewish groups that issued the call in an open letter to the White House chief of staff, Gen. John Kelly. "17 Jewish groups call on White House to fire adviser Stephen Miller," APN among 17 groups that called on White House Chief of Staff John Kelly to fire Stephen Miller. "Moving & Shaking: Shelley Berman Celebrated, Spotlighting Mizrahi Jews," The Jewish Journal featured a write-up of APN's recent event in LA honoring David Broaza and Rob Eshman. "BDS opponents want Israel held to a lower standard," Lara Friedman condemns politicians and groups pushing for anti-BDS legislation, which blatantly undermines free speech, and she contrasts this with the work of groups such as the ACLU, APN, If Not Now, and J Street. 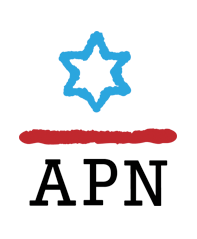 "Major Jewish Organizations Back Israel’s BDS Entry Ban, Barred Groups Call It ‘Bullying’," APN opposes list of organizations banned from entering Israel due to their support of BDS. "300 US Jewish clergy oppose razing West Bank village in letter to Netanyahu," APN co-sponsors rabbis' letter to Netanyahu opposing razing of West Bank village. "Trump Jerusalem decision opens Israeli expansionism floodgates," APN press release quoted in a story on repercussions of Trump's Jerusalem statement. "Time to rise above anger when confronting Israeli extremism," Ray Hanania wrote that Palestinians need to build relations with pro-peace Israeli groups such as Peace Now. "Left panics after Havat Gilad recognized," Quotes Hagit Ofran's explanation and analysis of the government's adecision to legalize the illegal outpost after Rabbi Raziel Shevach's murder. "Cabinet expected to give not to settlement status for Havat Gilad," Peace Now warned sucha move would be a grave mistake and that it would need to be evactuated in a final status agreement. "PM condemns Irish bill banning Israeli West Bank goods," Former Peace Now Director Tzali Reshef appeared on a list of Israelis supportive of an Irish bill that would outlaw importing goods from West Bank settlements. "Was leaving Likud the mistake of Moshe Ya'alon's life? An interview with Israel's ex-defense minister," In an interview, Ya'alon denies that he called Peace Now a "virus" in 2009 (despite a recording of his comments). "Settler growth rate declines for sixth straight year," Peace Now data cited in story on decline in settler population growth rate. "Democracy distorted: When the government funds a nonprofit’s political advocacy," Peace Now's Hagit Ofran quoted in story about Israeli right-wing nonprofit receiving government funds. "A former settler is bent on dismantling outposts he once toiled to establish"
Ex-radical Lubavitcher Shabtay Bendet has left old ideologies behind, but the new Peace Now staffer is still grappling with the life he created on the other side of the fence. "Settlement watchdog head resigns to run for Meretz leadership,"
"Outgoing Peace Now director announces bid for Meretz leadership," Avi Buskila, the former Director General of Peace Now, leaves to run in the Meretz leadership race. "Peace Now CEO resigns in bid for Meretz director position"
"Peace Now head running for Meretz leadership"
"Jordan, world countries reject Israeli settlement plans," Peace Now data quoted in story on settlement construction. "EU, U.K., Germany, and France Condemn Israeli Plan to Build Hundreds of Settlement Homes"
"Group: Israel OKs more construction in West Bank settlements," Peace Now: Israel's government OKs more construction in West Bank settlements. "Israel approves more than 1,100 new settlement homes in occupied West Bank," Peace Now: Israel approves more than 1,100 new settlement homes in occupied West. "Israel approves more than 1100 new West Bank settlement homes"
"Israel approves hundreds of new settlement homes: NGO"
"The Israeli 'Left' Is Gaslighting U.S. Jews Into Support for Trump on Jerusalem"
"Praise and Alarm from American Jews Over Trump's Jerusalem Move," APN's Debra DeLee quoted in a story about US Jewish reactions to Trump's move on Jerusalem. "'The worst thing he could have done': Middle East peace advocate," APN's Debra Shushan interviewed on Australian radio and TV regarding Trump's Jerusalem decisions. Listen to the radio interview here. "Jared Kushner talks about his peace plan, and leaves everyone guessing," APN criticizes the administration for not offering a conflict-ending horizon to Israelis and Palestinians. "Israel minister calls for more settlement approvals," Peace Now data cited in piece on Avigdor Lieberman's call for more settlement construction. "Emboldened Israeli Right Presses Moves to Doom 2-State Solution," Peace Now's Hagit Ofran quoted in story on Israeli right's drive to doom hopes for two-state solution. "Jewish National Fund involved in effort to evict East Jerusalem family," Peace Now's Hagit Ofran quoted in story on JNF's involvement in efforts to evict Palestinians from their home in Silwan. "Israel seized 2,500 acres of Palestinian land in 2017," Peace Now data cited in a news story on increase in settlement activity in 2017. "Government grants settlements NIS 40 million for security, first-aid," Peace Now blasts Netanyahu for new government grant to settlements. "Additional 40 million NIS allocated for settlement security," Peace Now condemns new government grant to settlements. "Israeli Attorney General Seeks to Save Buildings in West Bank Outpost From Demolition," After Peace Now wins Supreme Court petition, Israel's Attorney General seeks ways to save illegal outpost homes from demolition. "AG weighs savings six settler outpost homes," Attorney General tries to save settler outpost homes that Court ordered demolished after Peace Now won Supreme Court petition. "Israelis Rising Up: Remembering with Yuli Tamir and Janet Aviad," A tribute to Peace Now and two of its founders. "IDF weighs new tool to legalize settler outposts," Peace Now's lawyer rejects Israeli Attorney General's new tool for legalizing illegal outposts. "AG: Outpost law discriminates against Palestinians, should be repealed," Peace Now criticizes Israeli AG decision to allow expropriating privately-owned Palestinian land for access road to illegal outpost. "David Friedman Is Unfit to Be U.S. Ambassador to Israel. Fire Him." America has a problem in Tel Aviv. "Race is on for year-end giving," Like other small Jewish groups, APN is busy with end-of-year fundraising efforts. "Arab American groups offer PLO office space if it’s shut down," APN among groups urging the Trump administration not to shut down PLO office in DC. "Watchdog fears Israel will seize more Palestinian land," Peace Now: legal opinion by the attorney general could pave the way for the seizure of more Palestinian land in the West Bank. "In first, Israel Prize to be awarded for promoting settlements — report," Peace Now slams Bennet for reported intention to award Israel Prize to settlement activist. "Start preparing for one million settlers in the West Bank," Peace Now data quoted in story on settlement growth. "Tens of Thousands Attend 'Depoliticized' Rally Marking Rabin's Assassination," Peace Now participates in Rabin memorial rally. "Tens of thousands of Israelis attend rally marking Yitzhak Rabin’s murder," Peace Now participates in Rabin memorial rally. "85,000 attend rally marking 22nd anniversary of Rabin’s murder," Peace Now participates in Rabin memorial rally.